The PDA has been working to identify ways to improve business development and design improvements that will draw more people to stay and shop and enjoy what Philomath has to offer. In an effort to improve the physical appearance of downtown businesses, the City has created a 0% interest loan which is available to building owners to make exterior improvements to their building. The application and review process is simple with a quick turnaround once the required application information is submitted to the Review Committee. The Review Committee has the authority to work with applicants to develop an appropriate design and approve the loan amount. Applications can be submitted at any time and may be approved subject to the availability of loan funds. Eligible applicants must be the owner(s) of the building. Loans shall only be for facade improvements. All commercial and personal/professional offices and businesses located on Main Street from 20th Street to the west city limits and Applegate Street from 13thStreet to the west city limits. Other commercial and personal/professional offices and businesses located on side streets off of Main Street are eligible for consideration subject to funding availability. A maximum loan amount of $10,000 per tax lot may be awarded. The applicant shall match dollar for dollar the amount of the loan. Up to 10% of the total project request may be counted by the applicant as match for necessary project review, planning, architectural consultation and required fees or permits. Loan repaying to the City shall be completed within three years of initial disbursement. Loan funds shall not be disbursed if the improvements do not comply with the facade improvements approved by the Review Committee. Loan funds shall be disbursed after the applicant has paid the matching amount in full. The City shall pay only on a written invoice from the contractor that has been approved by the applicant. Partial disbursements shall be for no less than $500. All façade improvement plans must be approved by the Review Committee to ensure that they meet Philomath's Design Guidelines (a document produced by consulting architect David York 1998), and federal regulations, where applicable (for example, the Secretary ofthe interior's Standards and Guidelines for Archeology and Historic Preservation, regulations pertaining to lead-based paint, etc.). 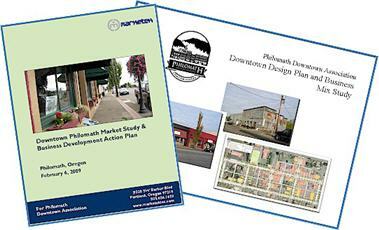 The City shall provide the grantee with a copy of Philomath's Design Guidelines. n Those property owners who received architectural services from architect David York as part of the Philomath Downtown Visitor Enhancement Project and their lessees are encouraged to implement the façade designs that York produced for their respective buildings. A detailed description of the proposed façade improvements, including specifications of the materials to be used. Written bid(s) from the contractor(s). The Economic Development Team gathers and interprets market information to develop an economic development strategy. They will identify new market opportunities for the commercial district, find new uses for vacant buildings, and stimulate investment in property.